How to Select the Best Electric Chainsaw? Choosing the best electric chainsaw for the money all comes down to what you need it to do. By working through your requirements and what the best brands, manufacturers and models are for that particular type of work, you can find the perfect chainsaw to get the job done correctly. What will your electric chainsaw need to do? You first need to establish the scale of the job. Will it require much manpower and labor? Will it be close to a power source? Do you need it for around the home, in a commercial setting, or in an industrial location? Are you using it in a professional or personal location? Establish first what you will be using it for, then the rest will fall into place. Your safety is paramount. The majority of new chainsaws are fitted with safety features to allow you to operate your selected electric powered chainsaw of choice with ease. Commercial grade chainsaws may also offer additional safety features for bigger engined machines. We live in a world where efficiency counts for a lot. We are looking for efficiency in every product and service we buy and use. Choosing a chainsaw is no different. Compare these components with the task at hand to ensure all will be suitable for the job. As consumers we are always choosing products which have premium marketing strategies. Look for words such as “extra” or “additional” or “leading”. This is their way of showing you they offer many features. Unlike their gasoline-fuelled counterparts, the electric chainsaw maintenance is minimal. This is what we love to hear, as we can often lack the time to keep tabs on components we should be filling up, draining, lubricating and checking. The extent of your maintenance will include blade sharpening – and this is important. When making your choice, consider its maintenance requirements. Each brand will be different, but there’s certainly no fiddling with spark plugs, mixing 2-stroke oils and dealing with grease and grime. Everyone wants a chainsaw which is not only affordable, but is great value for money and is the best deal on the market. In this buying guide you will find a lot of information pertaining to the pros and cons of certain electric powered chainsaws, comparable with their cost. Read all information carefully when you’re looking for the best option. What might seem like a bargain may end up costing you money. Make comparisons between a few different models and get a gauge on what’s a good price for what’s being offered. Below you will find our top five corded electric chainsaws, with pros and cons, their application of use, maintenance required and general information to aid you in your purchase. The cord feature means there’s no battery charging. They are a lot more powerful than people expect. The extension cords can be up to 100 feet in length which makes them a good option for around the home. They aren’t as powerful as gas chainsaws. They are limited in their reach due to their power cord. They aren’t suitable for big jobs. Each electric chainsaw will also offer different options for its use. Some will be best suited for around the home, whilst others may offer a wider reach – into a small workplace or a lifestyle block. Maintenance of electric chainsaws is fairly similar in each brand, but it’s not identical. Pay careful attention to what each brand requires. Some may be self-lubricating, whilst others need more attention to detail on your part. QWhat is the chain speed? QCan the bar length be changed? QWhat is the oil tank capacity? QWhat is the overall length? QWhat is the weight without the bar and chain? QWhat is the power type? If you’re looking for a leading brand which has delivered on its promise to create a zero-emission, powerful chainsaw, this is the answer. This Makita UC4051A does what all chainsaws do best – cut wood. It’s fast, lightweight, easy to handle, requires less maintenance and is underrated in terms of its power. It’s perfect for around home and can tackle most general backyard trees. Check out what other people who purchased this product think about it. 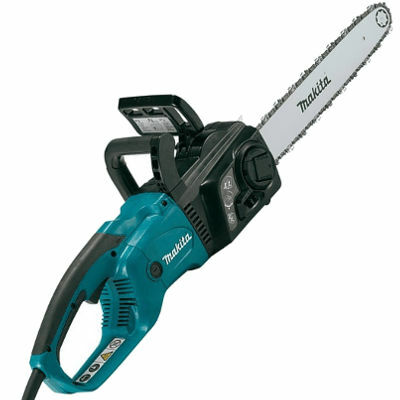 Read Makita UC4051A corded electric chainsaw reviews. QWhat is the bar length? QWhat is the power input? QWhat is the chain gauge? QWhat is the machine weight? The WORX WG304.1 offers consumers a lightweight and environmentally friendly alternative to a chainsaw. It has a 15 amp motor, auto-tension chain system and built-in chain brake for added safety. Maintenance is kept to a minimum, and it even offers automatic oil lubrication with a built-in oil reservoir. 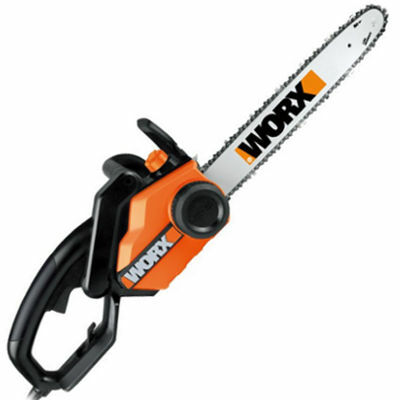 In terms of power, this WORX chainsaw can tackle backyard trees and shrubs with ease. It’s no stranger to tree branches and consumer ratings for this chainsaw have been high. It’s definitely a chainsaw worth adding to the garden shed. Check out what other people who purchased this product think about it. Read WORX WG304.1 18 Inch 15.0 Amp corded electric chainsaw reviews. QWhat is the power level? QWhat kind of chain does it use? QWhat is its resting chain speed? QHow much does it weigh? What was generally the electric chainsaw’s only form of maintenance has now been removed thanks to the Oregon CS1500. Aside from being lightweight, inexpensive, powerful and energy efficient, it now boasts the only self-sharpening chain on the market – PowerSharp. This is a top-rated product which many homeowners swear by. This chainsaw also has a powerful 15 amp electric motor, an 18 inch bar with great cutting ability, and it’s perfect for getting firewood cut and ready for winter. All the maintenance this chainsaw now requires is lubrication. It really is one of the most convenient chainsaws on the market. Check out what other people who purchased this product think about it. Read Oregon CS1500 Self-Sharpening corded electric chainsaw reviews. QWhat is its power source? Although this 12 amp chainsaw is lacking power against its other electric counterparts, it seems to cope with most backyard trees with ease. It’s a little clunky in design, with seemingly ‘cheap’ parts, but it can still get the job done. A major drawcard of this item, and the entire GreenWorks brand, is that it comes with a four year warranty. It also releases zero emissions. Overall, this chainsaw is a great option for those looking to only do the odd bit of property maintenance. Check out what other people who purchased this product think about it. Read GreenWorks 20022 16 Inch 12 Amp corded electric chainsaw reviews. When it’s been in use for a while the engine heats up and starts smoking. You need to stop using it until it cools down. QHow many amps is it? QWhat bar does it come with? QWhat size is the chain? QWhat is the chain oil capacity? QWhat is the chain pitch? For the homeowner who doesn’t require a large saw, this one is perfect. It features great safety features, a two year warranty and an 18 inch chain and bar which is perfect for around the home. Smaller parts aren’t as well manufactured as you would want them to be, but replacement parts are inexpensive and repairing them is not complicated. It’s lightweight, very easy to use and doesn’t make much noise. As with any electric chainsaw, the cord can result in a reduced reach but a heavy duty extension cord can amend this. Check out what other people who purchased this product think about it. 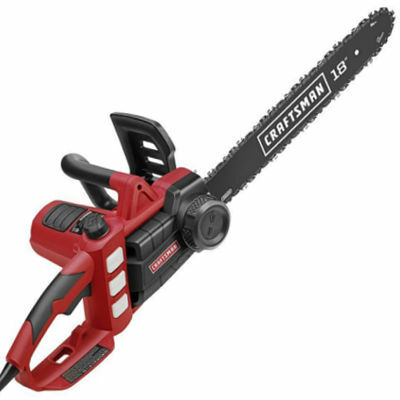 Read Craftsman 18 Inch corded electric chainsaw reviews. Cordless electric chainsaws remove the need for extension cords, as well as having a less restrictive reach. They are perfect for small home cutting jobs, and are lightweight and agile for those who are not strong enough to control a larger, fuel operated chainsaw. Maintenance is also minimal. If you are interested in this type of a chainsaw, you would love to read this full buying guide on how to select the best cordless electric chainsaw for the money including reviews & comparison. Cordless electric chainsaws with an 18 inch chain and bar will suit a majority of household owners for property maintenance. Safety chains help reduce kickbacks. They make less noise than fuel chainsaws. They don’t need any fuel to operate – just a power source for the battery. They don’t have the same cutting power that gas saws have. Cutting large trees can put stress on the machine. You have a short cutting time before the battery needs charged. The batteries are expensive to replace once they stop holding a charge. 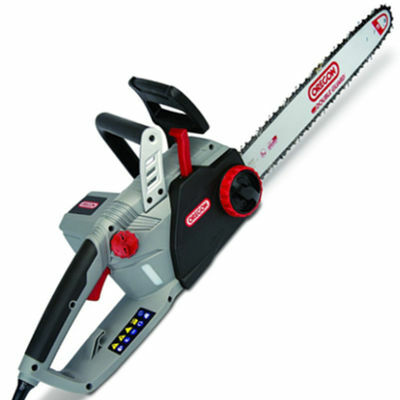 A cordless electric top handle chainsaw which is battery powered is largely used for home maintenance. Because of its rather short battery life, you will need to be near a power source to fully take advantage of all it has to offer. It is not suitable for commercial or industrial use on a large scale, and is more in its prime when up against small trees and small lots of firewood. Maintenance for cordless electric chainsaws with batteries is minimal. There is no need for oil changes, spark plugs, air filters or fuel draining for storage. The extent of maintenance includes the correct charging of the battery as per the manual’s instructions, the correct sharpening techniques of the blade and chain tensioning. For those hard-to-reach branches, an electric pole chainsaw is an ideal addition to your toolshed. Although quite different from a standard chainsaw, they are used by many people looking to undertake pruning jobs. If you are interested in this type of a chainsaw, you would love to read this full buying guide on how to select the best electric pole chainsaw for the money including reviews & comparison. The price is right – they are a cost-effective option when compared with other chainsaws. They can reach places which may be difficult for handheld, heavier chainsaws. They run on power, therefore do not need fuel. Cord length – the cord length can sometimes not be long enough, and using extension cords can drop the power. They are not as powerful as gas chainsaws. Many people prefer the poles to be made out of aluminium which is often not standard. The electric pole chainsaw is best suited in a home environment for trimming trees, hedges and small suburban shelter belts. Maintenance is limited to general wear and tear, and chain sharpening. There is no worrying about filters, spark plugs or fuel. There’s also no need to drain fuel for storage as it doesn’t require it for use. With age, it will pay to have the power supply checked by an electrician, and the pole will need strength tested. Where to Buy Elecric Chainsaw? There are so many stockists of chainsaws, including the manufacturers themselves. You can purchase from your local hardware store – even Walmart – but the best places to purchase them include direct from the manufacturer, a trusted supplier, and on websites such as Amazon or Ebay.